To commemorate the 70th anniversary of the start of the Battle of Anzio, LIFE has published a series of previously unseen photos chronicling the gruesome stalemate and lethal violence that characterized the operation. All images and captions Life/George Silk. 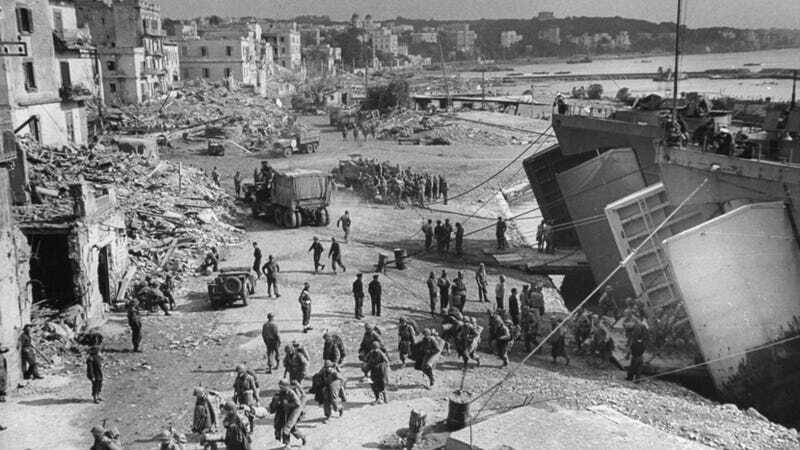 Called Operation Shingle, the attack at Anzio occurred six months after the Allied invasion of Sicily. On January 22, 1944, American and British troops made their amphibious landing at Anzio, a mere 30 miles south of Rome. American hospital tents being erected below ground level for protection from enemy shelling. But the Allies failed to seize the early initiative, resulting in a World War One-like statement that latest for four months — a campaign that saw some of the fiercest, most prolonged fighting in World War II's European theatre. American Military Policeman Ray E. Kellogg directs traffic in bomb-shattered Anzio. By the end of it, the Allies suffered over 66,200 casualties (of which 37,000 were noncombat casualties). German figures were comparable. American soldiers relax with their mascot, "Axis Sally," which was "liberated" during the battle for control of the Anzio beachhead. a New Zealand native who covered the war from the North African desert, through Rome, up to Belgian's forests and into Germany itself, spent months with the Allies after they landed at Anzio, chronicling what LIFE magazine at one point characterized as a "slow, maddening, fruitless battle." In late May, the Allies finally managed a breakout assault, supported by artillery and air power; in early June, Allied troops entered Rome virtually unopposed. Sign posted at intersection in the American sector. American commanders in underground headquarters, housed in a centuries-old network of catacombs. American soldiers sight a mortar from a dugout behind road embankment during the fight. Ducking to avoid German fire. From photographer George Silk's notes: "William P. Chirolas displays things that men in M Company don't like: Dextrose tablets . . . Barbasol . . . Fleetwood cigarettes . . . processed American cheese . . ."
Wounded American soldier treated at battalion headquarters while awaiting an ambulance during the fighting. Smoke rises from the German lines. Much more at LIFE, including photos of Anzio that did make it into the magazine. And be sure to check out these unpublished color photos of WWII American bomber crews.